WILLEMSTAD – The Public Prosecution has taken note of the events in Parliament this afternoon. In response to these events, the Attorney General has ordered the Investigation Team Curaçao to carry out a criminal investigation. Member of Parliament Giselle McWilliam has filed a formal complaint against Jacintha Constancia MP. Elsa Rozendal MP has also filed a complaint against Mrs. Constancia for threats. 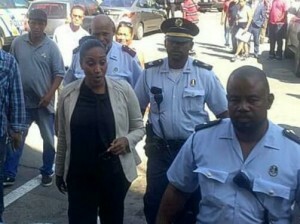 Constancia was arrested by the police and is currently being interrogated by the Investigation Team Curaçao.